This was an attempt to SMS text and an image to my blog from a mobile phone. None of the text made it into the blog – lost somewhere along the way. The image clearly worked and I have managed to blog both an image and text from a phone, via flickr, using the phone email option rather than SMS. There appears to be an issue with how flickr interprets the SMS message. This entry was posted in Learning thoughts on August 29, 2005 by Stephen Powell. 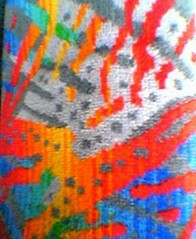 It is a picture of a bus seat.